How Much Does it Cost to Power Wash Siding? Are you considering revitalizing the look of your home’s exterior, but don’t want to go to the expense of putting on new siding or painting it? Maybe you just want to clean up the look of that siding, but you’re unsure of what is best: power wash or pressure wash. A power wash can make your siding look brand new. 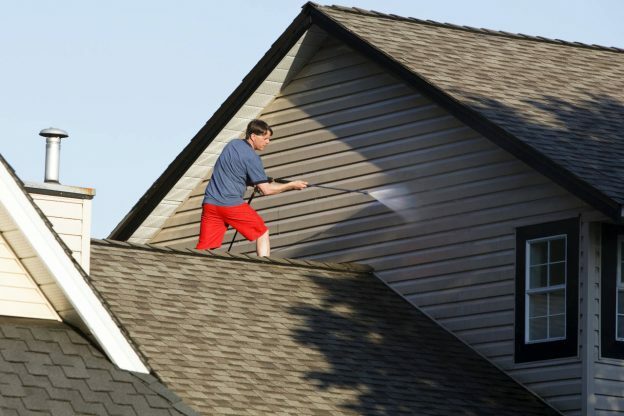 In this article, we will give you as much information as we can about each procedure, power washing and pressure washing, so you can make an informed decision on what is best for your situation. When you plan to hire professionals, strong negotiation skills from the standpoint of knowledge will help. The more you know about power and pressure washing, the better your chances are of getting a fair price. If you need siding repairs before or after a power wash, check our siding repair cost guide. Whichever you decide to use, you can usually rent or buy the equipment and get the cleaning supplies at a local building supply centers. The electric power washers cost around $90 – $300, and gas pressure washers can go up to $300 – $800, but those are stronger and more powerful than electric models. Sn environmentally-friendly concentrate runs about $20 per gallon. There are extreme differences between a power wash and a pressure wash. Power washing usually uses hot water to eliminate dirt, dust, mold, and other fungi that might make your siding look old and unkept. Pressure washers use high-pressure water, 1,000 to 1,500 psi, to knock off the dust, dirt, and grime. However, this high-velocity operation is more suited for brick, concrete, and painted wood siding as a preparation for, or instead of, scraping. It is not recommended for aluminum or vinyl siding, as it could dent aluminum or knock vinyl off your home. When preparing for either a power wash or pressure wash, some of the expenses you will need to consider, other than equipment and labor, are those essential to site preparation, such as relocating, removing, replacing, repairing, or otherwise modifying outside electrical and plumbing components to keep them from getting damaged or causing damage. Heating, ventilation, and air conditioning (HVAC) structures and systems might need to get covered or protected from overspray during cleaning. Any electrical outlet or HVAC connection should be protected from pressure washers particularly. Wrap these in tied down vinyl or canvas tarps. Many power wash companies will give you a flat price like $200 – $300 regardless of the size of your home or how many square feet of siding. However, the national average for a siding power wash is $0.33 – $0.40 per square foot. Some preparations might require a little higher price. Getting everything done at once will cost you: siding, $250 – $450; driveway normally $130 – $220; and deck or patio, $225 – $400. You might get a power wash service to do everything for $1000. A power wash is usually a better approach for most sidings. However, before you DIY or hire a professional, get an independent appraisal. Having an impartial party give you the pros and cons of power washing your siding is a good idea no matter if you DIY or hire someone. For the price of a good machine and the supplies, you can likely do a DIY pressure wash cheaper than hiring a professional. However, pressure washing it NOT commonly recommended by professionals for most siding. Have a professional assess your siding to determine if it is safe for a pressure wash. Even when the siding is safe to get pressure washed, windows, screens, and seals around windows and doors can get damaged. Pressure washers charge basically the same as power washers but check each estimate to ensure you are getting the same services for the same price. These are great for washing cars, grills, driveways, and brick paths. Just plug it in and set it to 1,000-1,300 psi, add the soap, and you’re all set. As long as the electric stays on and you don’t run out of cord, you can continue. These cost $90 – $300. These gas pressure washers are more portable than an electric washer that only has the range of the electric cord and whatever extension cords you might have. Gas-operated washers can go just about anywhere, and you won’t be hampered by tangled cords, but you can run out of gas. These are a little more expensive at $300 – $800. When you get estimates for either power washing or pressure washing, make sure the company has liability insurance and a license to operate in your state. Some states do not require a handyman service to possess a license but force general contractors to carry one. Usually, the difference is that contractors do work which requires a permit from the building inspector’s office.